Providing great customer service is more important than ever and companies that are investing in their employees and technology are seeing big payoffs. According to the Temkin Group, a modest improvement in CX generates an average revenue increase of $775 million over three years for a company with $1 billion in annual revenues. Consumers are willing to spend more money with companies that deliver excellent service, and they stop doing business with companies who provide poor experiences. Companies globally are using technology to provide better customer support. Without automation, it would be near impossible to gather and analyze the data you need to make fast decisions and follow-up with customers before they churn. By investing more in technology, you can help customers get their questions answered faster and have a seamless experience. Understanding customer service X-data metrics like customer satisfaction (CSAT), Net Promoter Score (NPS), and Customer Effort Score (CES) is a crucial element to understanding customer satisfaction and increasing loyalty. 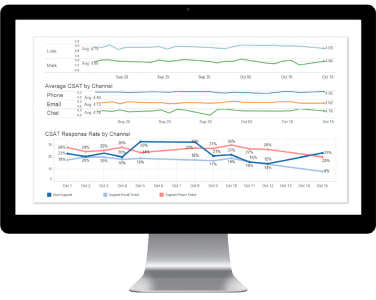 Customer experience management software allows you to engage with customers at their convenience and get feedback in real time, so you can make necessary adjustments. The best customer experience management programs track every customer interaction and analyze the data to close the gap between what customers expect and what the experience currently being delivered. Once you’ve gather X-data feedback, it’s important to close the loop with every ticket and make sure your customer’s issue has been resolved. Since it can be near impossible to keep track of every ticket manually, you can operationalize the process with ticket followup. Acting on feedback quickly can turn detractors to promoters. With automated ticketing, root cause analysis and resolution tracking across the web, SMS, Slack and many more, you’ll be able to act fast to resolve issues and reduce customer churn.